This blog post comes from Paul Paradis, Cofounder of Sezzle. 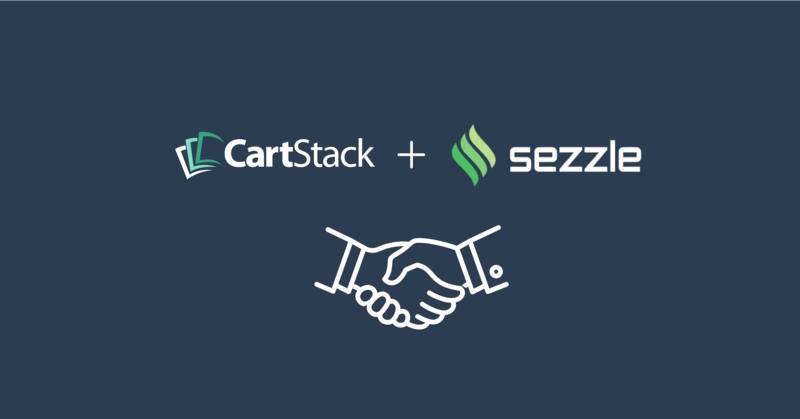 CartStack and Sezzle have partnered together to increase the value provided to each other’s customers. If you’re a subscriber to CartStack’s blog, you’re likely aware of how big an issue shopping cart abandonment is in eCommerce. An average of 37 different cart abandonment studies shows that around 69% of all online shopping carts are abandoned. While many of them are caused by people “just browsing,” other studies show that 46% of cart abandonments occur at the payment stage, and 72% of online shoppers in the US say an order being too expensive is a top reason for abandonment. Merchants have a very hard time getting consumers to complete checkouts online. Many consumers are abandoning checkouts because they can’t or don’t want to pay the costly total at the time of purchase. Because of these realities, Sezzle and CartStack have decided to partner up. Like CartStack, Sezzle helps merchants improve conversion, but we solve this problem in a very different and complementary way. Sezzle is a revolutionary eCommerce payment platform that helps merchants increase conversion by enabling their customers to ‘buy now and pay later’ with interest-free installment plans. Think of Sezzle like a reverse layaway option, with customers receiving their items immediately but paying over time. Since launching in August 2017, Sezzle has taken eCommerce payments by storm, helping their 120+ merchant partners lift conversions by 10% and basket sizes by 55% on average. Why wouldn’t my customers just use their credit cards? When it comes to paying for things, young consumers today behave very differently relative to previous generations. A Bankrate study from last year found that only 33% of millennials own a credit card. A separate New York Times analysis found that the percentage of people under the age of 35 who carry card debt was at an almost 30-year low. For the youngest millennials, credit is becoming harder to get. Consumers in their early 20s are having an especially hard time these days qualifying for new cards. As a result of the Credit CARD Act of 2009, would-be borrowers under the age of 21 can’t qualify for a new credit card unless he or she can prove they have sufficient independent income to repay their bills or if they can convince a more qualified borrower to co-sign for their card. The CARD Act also cracked down on issuers’ ability to market to college students on campus or offer gifts in exchange for filling out an application, making students less likely to sign up for a card on a whim. Now, some credit card issuers are making it even harder for would-be millennial borrowers to access a new credit card. In December 2016, Discover became the latest credit card issuer to announce that it would no longer allow people to co-sign for other people’s cards. Most other major card issuers, including Capital One, Chase and Citi, also bar student applicants from recruiting co-signers for their cards. Experts say that a lack of access to credit at a young age could have long-term consequences for millennials who want to apply for more credit down the line. To qualify for credit, you must prove that you can responsibly use it, which can feel like a tall order for consumers who have never borrowed in the first place. For millennials who have struggled to qualify for credit in the past, passing that test and qualifying for a new card could feel like such an overwhelming hurdle that they don’t even bother to try. That’s where Sezzle comes in. Introducing this new payment solution to the market will decrease abandonment rates for merchants and enable consumers to build credit by paying for things over time in a financially responsible way. “How does it work?” Glad you asked! Sezzle enables consumers to pay for their purchases in four equal installments, spread over six weeks, while paying the merchant in full, upfront. Consumers pay Sezzle 25% at the time of purchase, and are then set up with an automatic repayment plan that has them pay an additional 25% every two weeks till the bill is paid in full. And they’re not charged one cent of interest. Consumers that would normally have been scared off by high purchase totals will now complete checkout with the knowledge that they can pay over time. Other consumers will simply buy more than they otherwise would have. And this can all be done without the worry of hidden fees, high interest rates, and remembering to pay bills on time — age-old issues with credit cards. This solution is intended to help consumers with more than just buying more stuff, though, so all repayment activity will be reported to the credit bureaus. If they pay their installments on time, their credit score goes up. If they miss payments repeatedly or don’t pay it back, their credit score goes down. It’s that simple. By now, I hope it’s clear why Sezzle & CartStack are partnering. CartStack can help Sezzle customers recover more abandoned cart revenue by creating custom tailored reminder emails. And Sezzle can help CartStack users increase conversion and basket sizes by increasing young consumers’ purchasing power. As a sweetener, Sezzle would like to offer all of CartStack’s customers and subscribers one free month of payment processing! There are no setup fees or monthly fees with Sezzle; only transaction fees. So if you want to give Sezzle a try for a month to see how effective it will be for your store, you can do so at no cost or risk to you. Just go HERE to sign up online and enter SZL201022 when prompted for a referral code. We look forward to working together to help you sell more!